When I saw Jupi play this, I could see what she meant; it looked like some complex number crunching was needed. I found the game a little confusing, and it could have benefitted from some extra explanation; but hey, deadlines. I note that partly due to my own failings. All that said, once I sat down and started playing I got into it. I started to get a feel for what to do and had a lot of fun playing it. Way too much fun - I've wasted more time than I meant to playing this. Criticisms aside, this was a fun game I'd gladly play again. A downloadable shoddy incomplete game. 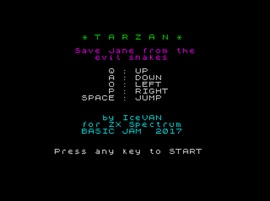 A snake game for the ZX Spectrum. Made in BASIC. A downloadable b-elite for Windows, macOS, and Linux.